takes an up close look at those most affected by Act 33 through personal interviews with teens previously and currently incarcerated in adult jails, and their families. They describe in detail their experience of being a teenager within the adult criminal justice system: from the education system, to the food, to the violence that they encounter everyday. A judge, social worker, and teacher are also filmed discussing their experiences working closely with youth charged as adults. Stolen Dreams II: Breaking the Cycle of Youth Trauma, Violence & Imprisonment is an inspiring film that reaches out to communities to help get the word out about stopping violence & finding creative outlets to address these certain type of issues. In this film, you'll hear from young people in adult county jails, people who've lost loved ones to violence, & hear about how trauma is so prevalent in our communities. We hope that this film gives the audience a deeper understanding of how young people in Philly are impacted on the daily basis by violence & imprisonment. In telling these stories, the film educates the audience about Act 33, a 1996 amendment to Pennsylvania law that allows prosecutors to try young people 15 and older directly in adult court and send them directly into adult jail for all serious, violent charges. We hope this film will educate you, inspire you, and help build a movement to change Pennsylvania law and keep young people out of adult prisons. 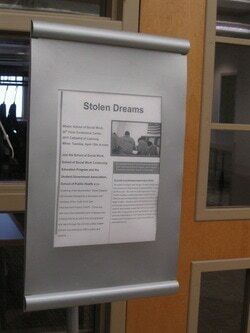 "Stolen Dreams" can be purchased for $15 "StolenDreams II" $20. Please send an email to yasproject@gmail.com if you are interested in purchasing a copy.